FORE! SWING INTO ACTION FOR BÓTHAR! 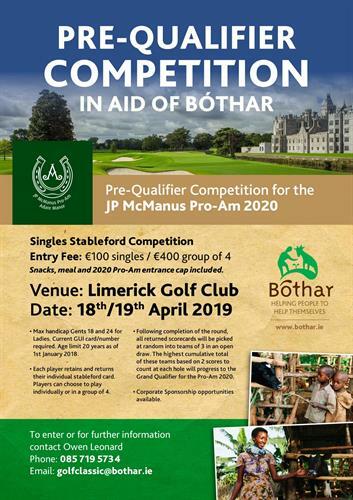 Bóthar wants golfers to take part in its JP McManus Pre-Qualifier Competition in Limerick Golf Club on Thursday 18th and Friday 19th April 2019. Organiser Owen Leonard is asking the golfers of Limerick and beyond to come out and support Bóthar’s efforts in a fortnight's time. Owen added; “For €100, you get your round of golf, a meal, some snacks and your 2020 Pro-Am entrance cap, which in itself is worth €50, so there is a lot on offer for the €100 entry fee. 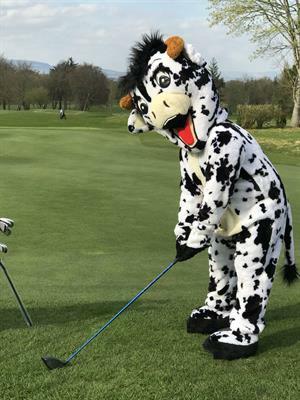 This competition is a Pre-Qualifier to the JP McManus Pro-Am 2020, which will take place in Adare Manor, with celebrities and professionals Limerick people have ever only read about in the Limerick Post! It is an amazing occasion and one we are so proud to be associated with. It's a great day out with some fantastic prizes on offer, not least the opportunity of playing in Adare Manor in the Grand Qualifier." As a Limerick-based charity, Bóthar is hoping that the competition is a resounding success. All funds raised from this fundraiser will go towards supporting Bóthar’s dairy cow projects in Rwanda. Receiving the gift of an Irish dairy cow or goat will be the first time that many of the families Bóthar works with will earn an income and this gift of a food-and-income-producing animal is like receiving the keys to a successful business. Bóthar has been sending Irish dairy cows and other food-and-income producing animals such as goats, pigs and sheep to Rwanda – it also has projects elsewhere in Africa, Eastern Europe and Asia - since the late ‘90s thanks to the generosity of the Irish farmers and the wider public. The donation of Irish cows, which have a yield six times that of the best local cows, have had a transformational effect on the lives of an estimated 1,000 plus families. Bóthar heifers arrive in calf, with each recipient family agreeing to pass on the first-born female calf to her to another family. Bóthar returns each year to re-impregnate the cows, so the cycle continues. Prior to being given a heifer, each family undergoes a six-month programme of training in animal husbandry, water-harvesting and basic horticulture practices. Bóthar was originally established in Limerick in 1991 as an initial one-off gesture of airlifting Irish cows to 20 families in a poverty stricken region of Uganda to mark the city’s ‘Treaty 300’ celebrations. It has grown immensely since then with Irish dairy heifers from all over Ireland making the journey each year to the sunny climate of Rwanda.